Welcome to the final stop in my Halloween week blog tour for In the Shadow of Blackbirds. 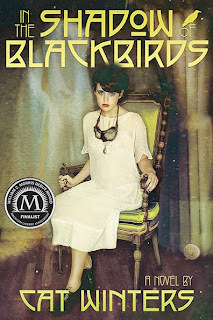 On Monday I was at IceyBooks with one of my Amulet Books siblings, Sarah Skilton, and on Tuesday author Mindy McGinnis interviewed me about the In the Shadow of Blackbirds cover at Writer, Writer, Pants on Fire. At both stops I've provided opportunities to be placed on my list to receive an advance reading copy of In the Shadow of Blackbirds. I'm also over at Corsets, Cutlasses, & Candlesticks today discussing the strange history of spirit photography...and explaining that ghostly figure that appears on my book's cover. And right here on my own site I'm celebrating Halloween with an In the Shadow of Blackbirds prize package that includes a signed bookmark, a signed bookplate, stickers, and a signed 12x18 In the Shadow of Blackbirds poster! In the Shadow of Blackbirds bookmark, stickers, and bookplate. Find the name of my novel's ghost. My ghost likes mysteries and word games and would love to send you on a scavenger hunt. I've slipped his name into one of this week's guest posts. Visit the three guest post sites, find his name, and enter it in the form at the bottom of this post. ONLY ONE ENTRY PER PERSON WILL BE COUNTED, so please enter only once. I'll pull a name from the correct entries using Random.org. The giveaway is international! DEADLINE: Tuesday, November 6, 2012, at midnight. THE CONTEST IS NOW CLOSED. THE WINNER WAS ANNOUNCED HERE. It's Day 2 of the In the Shadow of Blackbirds Halloween Week Giveaways, and I'm making a stop at Writer, Writer, Pants on Fire. 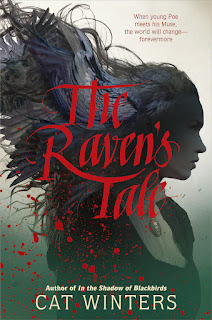 Author Mindy McGinnis (Not a Drop to Drink) interviewed me about my book's creepy-cool ghostly cover, so if you want to know the story behind the design (and what I originally envisioned for the cover artwork), head on over to Mindy's amazing site. Swag pack with a signed bookmark, stickers, and a signed bookplate. You can enter either here or at the Writer, Writer, Pants on Fire post. Good luck! Halloween Week Giveaway #1: IN THE SHADOW OF BLACKBIRDS and BRUISED ARCs! 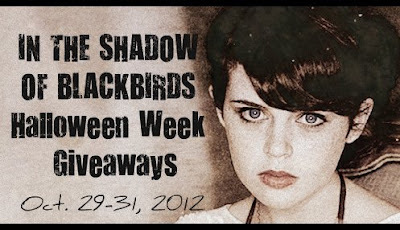 Welcome to Day 1 of the In the Shadow of Blackbirds Halloween Week Giveaways! Over at Iceybooks today, Sarah Skilton and I are discussing our respective 2013 Amulet Books releases. 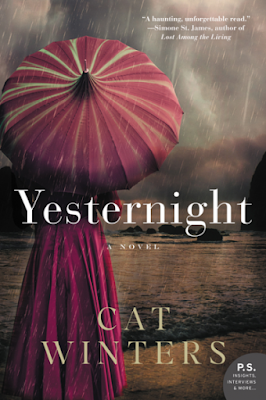 Sarah is the author of the contemporary YA novel Bruised, and my novel is a historical YA, so we're chatting about writing books set in the past vs the present. 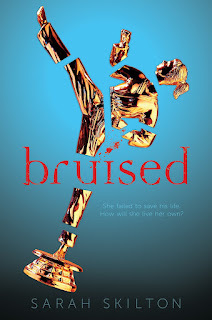 The giveaway: We're sending advance reading copies of both Bruised and In the Shadow of Blackbirds to one lucky winner! 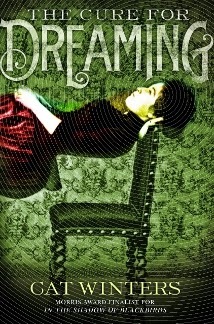 My ARCs should be arriving mid November, and Sarah's are already available to ship. We're willing to mail the books internationally, so anyone reading this post should scurry over to Iceybooks for details immediately. Good luck! My Halloween Week Blog Tour starts Monday... but I'm Offering One Giveaway Today! I'm excited to share all the giveaways that are waiting to be put in the mail during next week's Halloween blog tour. who comments on this post! You can still enter next week's giveaways (psst, those will contain even bigger and better goodies!). But this swag wasn't meant to just sit on my table in cardboard boxes. The bookmarks were designed by Amber at Me, My Shelf, & I. In the Shadow of Blackbirds advance reading copies (ARCs) are currently in production, which means my historical ghost tale will be heading out to early readers soon (approximately mid November). If you are a book blogger, reviewer, librarian, bookseller, or anyone else who typically receives ARCs, please fill out my ARC request form. I will forward all requests to my marketing contact at Amulet Books/ABRAMS. 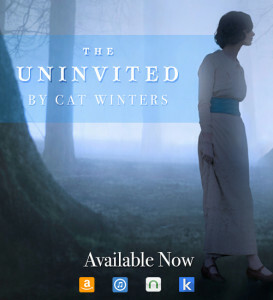 The novel will also eventually be available via Netgalley. If you don't fall into any of the above categories (or even if you do), I'll be providing opportunities to win ARCs, as well as swag, at two of my stops during my Halloween week blog tour. Check out last week's blog tour post for details. 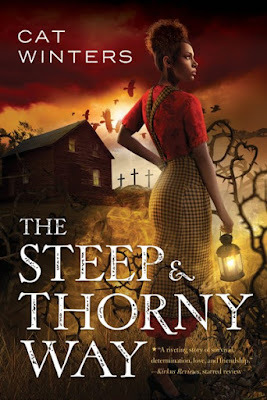 Today I'm blogging over at Corsets, Cutlasses, and Candlesticks, the new YA and middle-grade historical fiction site I launched with eight other authors in September. The theme this week is our favorite time periods, and I'm explaining how growing up near Disneyland in Southern California can turn a person into a historical novelist. I'm also kicking off my October tribute to Halloween music today by sharing my very first favorite ghost song, "Grim Grinning Ghosts"...also from Disneyland.